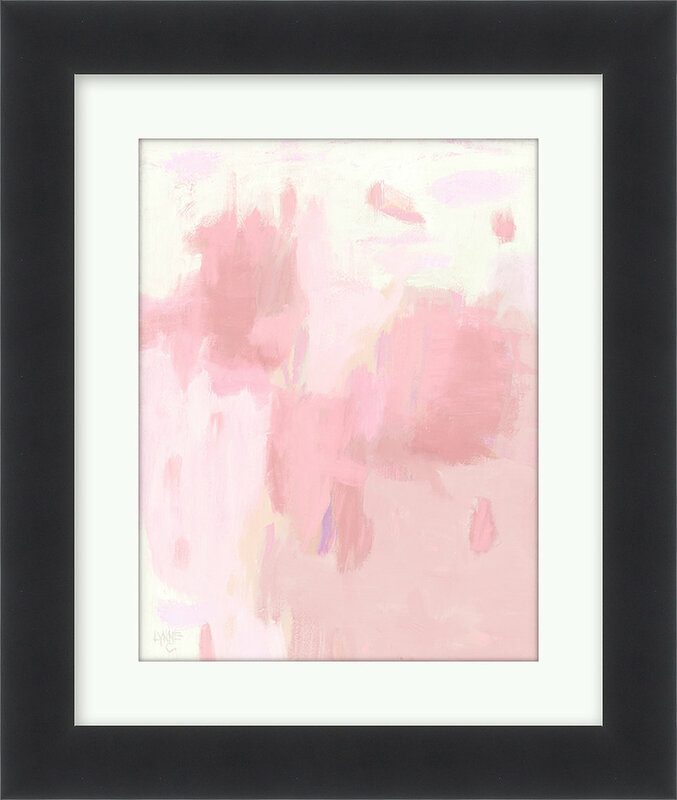 This piece ‘Ethereal’ is from a sun-reactive print on muslin fabric, from my garden roses. It’s painted in transparent and opaque textile paints, with outline stitching and a rose branch hanging bar from the same rose shrubs from my yard. The photo below shows the closeup of outline stitching in heavy thread. I’m dipping my toes in the textile art world and the art quilt world, having joined SAQA (Studio Art Quilt Associates) recently. I lean to the art side rather than the quilt side of this genre. This piece has some hand stitching, is three layers thick with a finished back; the bottom edge is intentionally left raw. I’ve been creating my own fabrics using textile paints since 2015 and along with the fabrics, a variety of textile pieces such as this. The call for art from Arts Benicia had the description for this exhibit: “for Artists working in all media . . . invited to share their botanical expressions and depictions.” The juror was Jennifer Perlmutter. The title ‘Ethereal’ describes short lived cut florals, along with my many gardens and landscapes changing over the years. The huge rose shrubs that I used for materials for this were pulled out recently (they’re gone!) to make way for a revitalization on our landscape - - thus the title ‘Ethereal’. The exhibit is open Nov. 10th through Dec. 21, 2018. The public reception is Saturday, Nov. 10th, 6:00 to 8:30 pm. More information in the Arts Benicia link. I once painted from life, or en plein air quite frequently. I miss the days spent outdoors, in the company of other artists painting on location in California, the Western U.S. and a few spots on the East Coast. Great times, invaluable experiences! However I was always wanting something more abstract than what I produced. Two summers ago I started a huge acrylic painting on canvas , painting on my back patio. 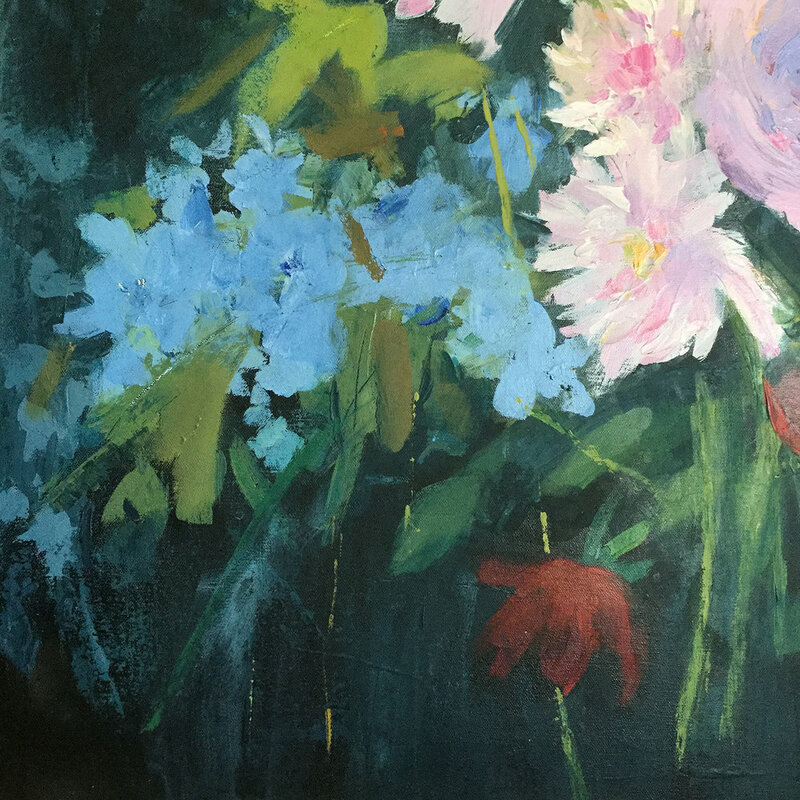 Seasonal, natural cues inspire my art: my floral garden, changing colors, the mood of a sky. 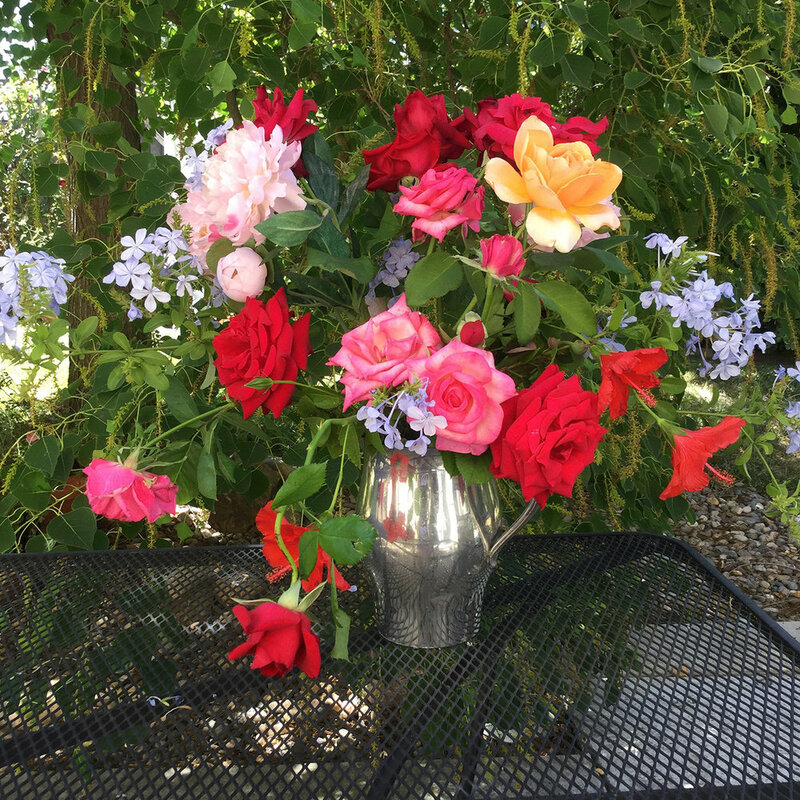 I cut a big bouquet from my roses and garden beds and felt a lightning-bolt of inspiration to paint. I kept cutting flowers, made an arrangement and began planning. We live in a hot summer climate and our backyard faces west. Those who know plein air painting know that acrylics can dry on your brush, that painting outdoors on a large canvas in acrylic is a challenge. SOOOO . . . I started in anyway. And then quickly moved to the garage, which was my acrylic painting studio. Here’s my big palette with the paints laid out, big brushes ready with the buckets of rinsewater. When you have a big canvas (28” x 42”) and are beginning a quick start in acrylic, you need to scale up in the size of the palette, your brush sizes, have lots of spray bottles around and use big palette knives. I play energetic music to keep my heartbeat and rhythms elevated. I got this far on the first day. There may have been a sketch, in paint on the canvas before I got this far - probably. I placed the flower shapes first with a background. The background I saw at the end of day was too dark, too black, but the arrangement of flower shapes was OK. There were some revisions, some struggles in the warm weather with wilting flowers, and some time spent sitting, staring at the canvas deciding what to do next. I revised the too-dark background, some colors on the florals, and throughout made sure my brushstrokes weren’t too exacting or studied. I intentionally left out the silver colored vase; I wanted a more naturalistic arrangement. I was an Impressionist first, and Abstract artist after . .. in this painting I really went back in time to my Impressionism. 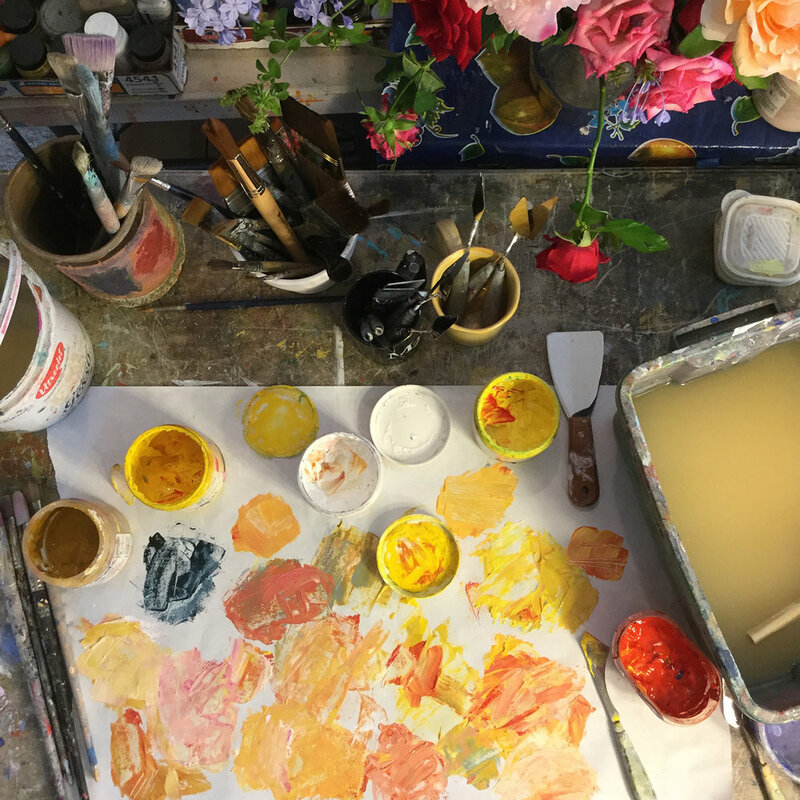 The painting turned out so floral and impressionist, I was thinking of my grandmother Agnes and her rose gardens. So my working title was “Florals for Agnes”. Acrylic paint is forgiving if you get to it at the right time to lighten, thin it out, scrape at it, all of which I used. Below are closeups, right and left. Here’s the finished painting, 42” x 28”, acrylic on canvas, “August Florals”, below, and be sure to check out the image at the end, the print of my painting offered by Anthropologie, in the Fall Collection 2018! 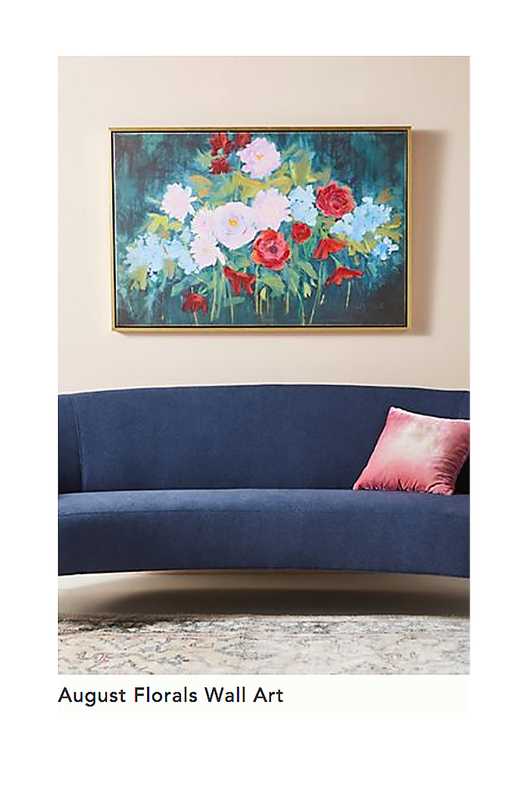 I cannot say how pleased I am to have another floral painting included in one of the print collections at Anthropologie - - see my blog for the other painting ‘Midsummer’ offered by this online store! Art has its seasons, just one of the reasons why I love making 'stuff': paintings, hand-dyed fabrics, textile collages. Summer is a natural time to be creating fabrics and the garage dye studio has been made functional again. Dyeing is a messy business . . . it's best to create dyed fabrics in a workspace that's functional. My laundry sink is nearby, the backyard clothesline is part of the process. I love the whole cycle of this process because it's so experimental and spontaneous, and the results often surpass expectations. Nothing better, or more to say than this!